Soldiers are only in the Army. That is a Marine Corps flag and a Marine kneeling in the pic. A Marine kneels like a Marine. The Marine Corps is actually a department of the Navy. Marines also work with Army soldiers at times. Marines and Army soldiers both have Infantry units. Marines can attack by land, air, and the sea. They get called soldiers a lot, but it's not their actual or proper title. Thank you for the info. I learned a lot here. The point I was trying to make is that it’s ok to kneel. The idea of kneeling with respect originated with the armed forces. 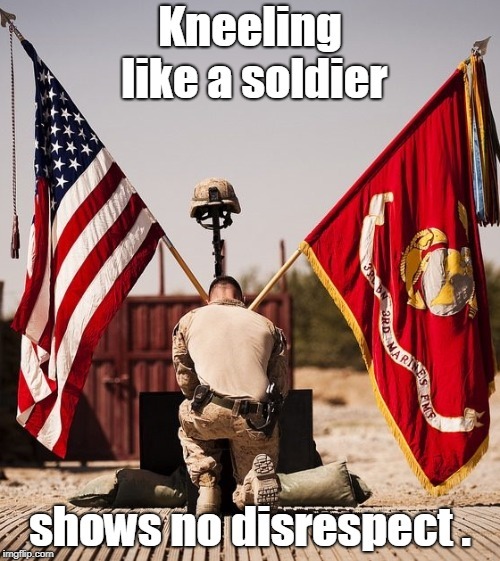 Kneeling like a soldier; shows no disrespect .